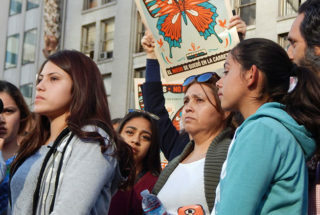 The family of Romulo Avelica, a father who was arrested outside his daughter’s charter school last March, at a rally in Los Angeles calling for his release from a detention center. As immigration issues drive more Latinos into political activism, education is a ripe opportunity for Latino parents to wield considerable influence. A panel of education experts at a national convention last weekend in Miami agreed that Latino parents have catapulted this year from being mostly silent on political issues to becoming a significant voice in the political scene because of what they see as hostile immigration policies. But they have yet to flex their muscle as a voting bloc in the area of education. The Latino vote was not a determining factor in the last presidential election and most likely won’t be in this November’s midterm elections, one panelist said. But education, another panelist said, is an area where Latinos can step up and have a big impact in their local communities. Miami-Dade Superintendent Alberto Carvalho, who leads the nation’s fourth-largest school system, which is predominantly Latino, lamented that education isn’t talked about by President Donald Trump nor addressed as a fundamental right in this country. “It’s shameful that education, for the first time in decades, didn’t factor as a memorable issue in the last election. I am hopeful that local activism will inspire people to advance the notion that public education and policy are part of the same coin. One suffers when the other doesn’t perform,” Carvalho said. 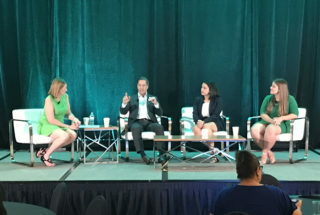 Carvalho was one of three panelists discussing “The Power of Education Reform as a Political Issue in 2018, 2020, and Beyond” at the National Association of Hispanic Journalists’ annual convention. The panel was sponsored by the Walton Family Foundation and moderated by Kathy Moore, executive editor of The 74. But Latino families are now stepping up to influence education, the panelists agreed. And they are not just active as volunteers in their classrooms but are becoming involved in the process of improving their kids’ education and their schools. “It’s not enough just to be active at your child’s school site. Now you have to go to board meetings and fight for your school choice, talk to your superintendent. … We are seeing Latino communities take on that challenge and rise to the occasion. These are just the first steps,” said Yannell Selman, founder and executive director of P.S. 305, a nonprofit based in Miami that organizes families to engage in their children’s education. “Now, because of the hostile climate, staying silent is not an option,” said Selman, explaining that culturally Latinos, particularly parents, used to remain silent because they felt safe if they weren’t visible. But after feeling threatened by Trump’s immigration policies, “It went from, ‘It’s not safe to say something,’ to ‘It’s not safe not to say anything,’” she said. Carvalho pointed out that the role of the federal government remains very important and that states should be under “the watchful eye” of the federal authority. “People think the bus (the federal government) is broken. The bus isn’t broken, the driver is broken,” he said, in a clear reference to the Trump administration. Another panelist, Evy Valencia Jackson, an education advocate and policy expert based in Denver, said that despite the low numbers of Latinos participating at the polls, their political participation could significantly improve education for Latinos. While the number of Latinos nationally who are going to college is slowly increasing, they are still not graduating from college at the same rate as their peers. In 2016, 47 percent of Latino high school graduates ages 18 to 24 were enrolled in college, but just 15 percent graduated from college, according to the Pew Research Center. In comparison, about 41 percent of whites completed college. Latinos’ high school dropout rates are also higher, at 10 percent in 2016, compared with 6 percent for all students. The panelists also agreed that Latino representation among educators should be a key aspect in the education reform conversation. The 74’s executive editor, Kathy Moore, far left, leads a panel at the National Association of Hispanic Journalists’ annual convention on July 21 in Miami. The panelists are, from left, Miami-Dade schools Superintendent Alberto Carvalho, Denver education advocate Evy Valencia Jackson, and Yannell Selman of P.S. 305, a Miami nonprofit. “Predominantly in Latino communities, still the leadership is not representative of classroom teachers and students and the representation at all levels, and that has a tremendous social impact on the child,” Carvalho said. He said the Miami-Dade public school system doesn’t have that problem because almost half its teachers are Latino. About 20,000 Latino teachers serve the district’s 354,000 students, of whom more than 70 percent are Latino. He said other districts with the same demographics should be as active as his Miami-Dade has been in recruiting Latinos. Valencia Jackson said in some parts of the country, like Denver, that’s not an easy task. The panelists also agreed that more accountability is needed for charter schools. “I have experience with charters in Florida and Northern California, two very different systems, but oftentimes I see something is missing on the part of accountability for charter schools,” Selman said. “Choice has been proven to be good. Choice is good; a reasonable, accountable choice is better,” Carvalho said. The Miami-Dade public school district was the first to have a district-managed charter school system, which is overseen by the district’s school board. Currently, there are 130 charter schools in the district, serving over 64,000 students in grades K-12, representing over 18 percent of the district’s enrollment. “The idea of innovation of charter schools is really powerful. I think they have created a healthy competition. Nothing is ever perfect, but I do believe that’s why you have state and local officials to regulate the schools,” Valencia Jackson said. She said her husband and her husband’s mother attended the same failing traditional public school in southwest Denver and that if it hadn’t been for a charter school that opened in the neighborhood, her nephew, the family’s third generation, would have had to attend the same failing school. Disclosure: The Walton Family Foundation provides financial support to The 74, the parent of LA School Report. This article was published in partnership with The 74.